Check out the National Link Coalition’s free Toolkit for Starting a Link Coalition in Your Community in our Resources section! The best way to stop multiple forms of violence perpetrated by the same abusers is for the agencies involved to communicate and collaborate. But in most communities, we have become a “nation of silos.” Child protection, domestic violence, animal care & control, and adult protective services operate in separate spheres, addressing one incident or type of maltreatment rather than seeing the larger cycle of violence that might be at work. Community Link Coalitions can inspire broader thinking and prevent harm by bringing animal control officers, veterinarians, child protection workers, domestic violence shelter staff, animal advocates, adult protection personnel, law enforcement, prosecutors, and other concerned community members together in a more effective, coordinated effort against linked forms of violence. Contact an existing coalition to learn from their experiences. And check out the free sample materials we have in our collection to see what they’re doing. 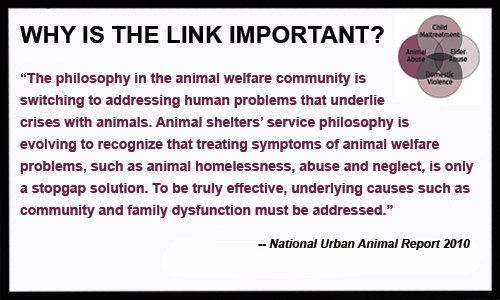 The National Link Coalition also has speakers who can meet with your community leaders to facilitate the formation of a Link Coalition in your area. Contact the National Link Coalition for details.